On December 8, composer Sandeep Bhagwati, currently in residence at Cercle Carré, will speak about selected compositions in a lecture-demonstration with many musical excerpts. 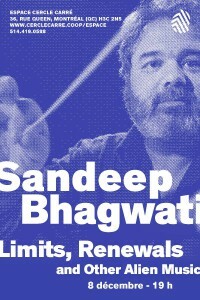 Sandeep will start off the evening by discussing “Limits & Renewals” for six singers and large orchestra, which he composed at Cercle Carré in 2011. He will also present his work on improvisation softwares in “Native Alien” to “Iterations”, and his current project with multi-traditional musicians from Chinese, Indian, Arabian, New Music, Free Jazz and Techno traditions in Berlin.